Ian Gould as Richard II listens as Melissa Meli (Bolingbroke) and Angus Hepburn (John of Gaunt) talk. 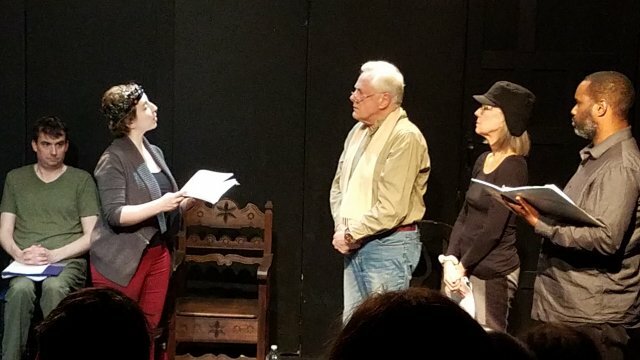 New King Henry (Melissa Meli) as Ian Gould is deposed Richard imagines himself as "nothing": "Nor I, not any man that but man is, / With nothing shall be pleas'd, till he be eas'd / With being nothing." C.A.G.E. 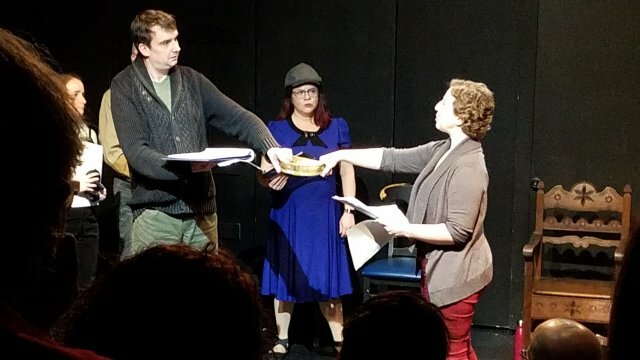 (Classical Avant-Garde Experimental) Theatre and DeSotelle Studios is committed to doing staged readings of eight Shakespeare plays in eight months. Richard II seems perfect for this form. Perhaps no Shakespeare play rests more securely in its lyric laurels. Rhymed couplets and parallel constructions abound for listening pleasure. The cast took full advantage under Katrin Hilbe's direction. Michael Hagins, the Artistic Director of C.A.G.E. Theatre Company, has been involved with 30 out of the 38 plays that are part of Shakespeare's canon as either an actor, director or fight director. This year, Michael decided to complete the canon by producing the final 8 plays he has never done. The C.A.G.E. (Classical Avant-Garde Experimental) Theatre of New York City is a company dedicated to bringing classical works to a modern audience. Richard II is the first play of the second history cycle in which the last of the Plantagenets, Richard II, is deposed by Henry Bolingbroke. Henry IV Parts I and II and Henry V follow. Thomas Mowbray, Duke of Norfolk, is implicated, with the King, in the earlier murder of Bolingbroke's uncle. Richard stole land too, and this is one of the sources of conflict in the play. Immediately Bolingbroke and Richard lock horns. Richard's greed and wastefulness lead to his downfall, as his subjects become disenchanted. Bolingbroke is able to capitalize on their anger. 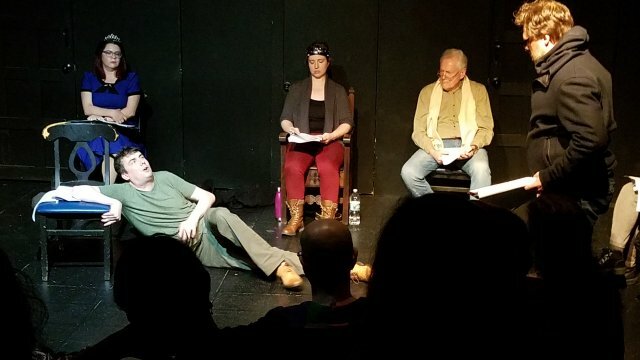 Each actor in this reading stands to deliver. Even on book, the magic of the language and the physical movement and reactions bring the characters to life. Gaunt is full of zip even as age overtakes him. The King is a complex, flawed character, who sometimes summons the dignity of his position and at others seems almost mad. Without losing stature, and perhaps even gaining it, he turns his kingship over to Bolingbroke when he realizes all is lost. Like Frederik Willem de Klerk in South Africa, he was smart enough to see that his time had come and gone. His poetry intensifies as his position is diminished. "Nor I, not any man that but man is, / With nothing shall be pleas'd, till he be eas'd / With being nothing". Ian Gould combines authority with indulgence in the complex role of the King who gives up the throne. Melissa Meli is superb as Bolingbroke. Without breaking a sweat or missing a beat she attends not only every syllable she utters, but also gives an acute listener's ear to every other actor. She adds gesture to her character's moods. Angus Hepburn, as John of Gaunt, makes his lines melodic. Andy Paterson as the ill-fated Duke of York is both urgent and determined. Katrin Hilbe has a special gift for making the most of the materials she works with. Here she brings to life the characters in Shakespeare's play with emphasis on the language, which clearly is some of the Bard's richest. These C.A.G.E. performances are a special experience.